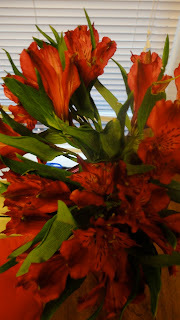 I bought these red flowers for my kitchen. I thought it'd be nice to have some color in my kitchen, plus I figured the flowers would help to neutralize odors! I also have a red seat cushion and a painting on the wall with red matting and details, so everything matches. Thanks sweetie, I just followed back! Can you see me? Thanks! It's not showing you on my followers list, but maybe it's delayed. thanks!! i just followed your blog- its cute!